HOUSTON-(May 16, 2018) – Researchers at Houston Methodist and Rice University have made a discovery that will impact the design of not only drug delivery systems, but also the development of newer applications in water filtration and energy production. They made this discovery while investigating how the drug molecules in solution travel through a nanochannel drug-delivery system developed by Alessandro Grattoni, Ph.D., chairman of the Department of Nanomedicine at the Houston Methodist Research Institute. The team's findings are described in an article titled "Unexpected behaviors in molecular transport through size-controlled nanochannels down to the ultra-nanoscale" in Nature Communications, a multidisciplinary journal dedicated to publishing research in the biological, physical and chemical sciences. This nanochannel delivery system (nDS), designed by Grattoni and Mauro Ferrari, Ph.D., president and CEO of the Houston Methodist Research Institute, and colleagues, is a membrane that acts as a filter with hundreds of thousands of uniform nanoscale channels. The membrane is created with semiconductor technologies commonly adopted for fabricating computer microchips. 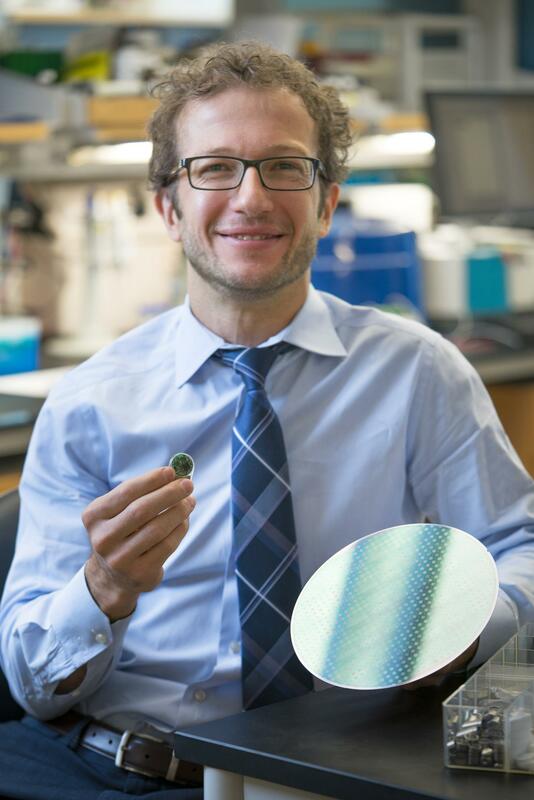 "Our lab develops implantable systems for controlled drug delivery to treat chronic diseases over extended periods of time," said Grattoni, the lead author. "These implants use silicon nanofluidic membranes, each of which has a precise number of identical nanochannels." This leading-edge membrane technology studied at Houston Methodist presents key properties for use in a drug-delivery implant — mechanical robustness, biochemical inertness and high-density of nanochannels that allow drug delivery at clinical doses from a tiny membrane. "We are interested in better understanding what happens inside these channels and in what way the drug travels across them," Grattoni said. "Particularly, we are focusing on the physics that underlies the transport across these membranes. This insight could additionally be useful in the extraction of natural gas, renewable energy production, and in fluid and water filtration." Grattoni says there are many different applications for this technology. In the context of drug delivery, this platform is considered 'drug-agnostic,' which simply means the same membrane technology can be used for a wide spectrum of drugs, and just the size of the channel is what needs to be customized. The results of this study provide new insight into the channel function. Since different size drugs vary in molecular weight, characteristics and properties, the team experimentally developed an algorithm for selecting the size nanochannel that is the most appropriate to use for each drug. Upon putting them to the test, however, they discovered intriguing, unexpected molecular behavior in these channels. They found this by studying channels so small that they are comparable in size to the drug molecules. Specifically, they used nanochannels of just 2.5 nanometers in size, nearly 20,000 times smaller than a human hair or 2.5 billionths of a meter, at a scale defined as the 'ultra-nanoscale.' In these tiny spaces, molecules interact with the channels so strongly that their transport is substantially altered. To test these differences, the research team took their membranes and developed them with different channel sizes, going in incremental steps from very small channels at the ultra-nanoscale all the way up to almost the micron scale, ranging from 2.5 to 250 nanometers wide. Their intent was to go from very small to very large channels with continuity, so they could study scaling properties. "My part was pushing the mathematical and theoretical description to its limits, so we could test whether what we were observing was something novel or not," said Rice theoretical physicist and co-author Alberto Pimpinelli, Ph.D. "With these tools, we can work out theories that are superior to any in existence, because experiments can be done with such precision." They observed that molecules with positive and negative charges behaved about as expected as they approached and passed through the tiny channels. No surprises there. However, when it came to neutral molecules, which were expected to be unaffected by charges, they uncharacteristically behaved as though they were carrying a charge, which was a wholly mysterious result they couldn't explain with current molecular transport theories. Additionally, for all the molecules – positive, negative and neutral – they observed a very steep, abrupt decrease in transport rate and diffusivity across the membrane at the ultra-nanoscale, below a nanochannel size of 5 nanometers. "In the paper, we tried using already available theories to explain these unexpected effects and analyzed several mathematical models," Grattoni said. "However, we realized those models were incapable of explaining any of these factors, which told us we were observing something novel that hasn't been shown before." To date, theories have been describing the transport of molecules and fluid as being almost like a continuum. However, Grattoni says, now scientists must begin considering the discrete nature of particles, possessing finite molecular volumes, to be able to explain what was observed in these studies. "We will have to develop new models where we start considering the fluid as the sum of the individual particles with very specific volume and shape, down to the molecule," he said. "Until now, there were certain algorithms determining this, but now we must add in another variable with the introduction of molecular influence." Pimpinelli adds, "These results are interesting, because they challenge our theoretical understanding of how transport of simple but charged molecules into a relatively simple environment works when the scale is on the order of a few nanometers. Some new understanding will definitely come out of this." Pimpinelli, a professor of physics at the Université Clermont Auvergne in France and adjunct lecturer in materials science and nanoengineering at Rice, is executive director of the Smalley-Curl Institute and an affiliate member of the Houston Methodist Research Institute. Grattoni, in addition to being an associate member of the Houston Methodist Research Institute, is an associate professor of nanomedicine with the Institute for Academic Medicine and holds secondary appointments with the Departments of Surgery and Radiation Oncology. Other researchers collaborating with Grattoni, Pimpinelli and Ferrari on this paper include Giacomo Bruno, Nicola Di Trani, R. Lyle Hood, Erika Zabre, Carly Sue Filgueira, Priya Jain, Zachary Smith and Sharath Hosali with Houston Methodist Research Institute, and Giancarlo Canavese and Danilo Demarchi with Polytechnic of Turin, Italy. Bruno and Di Trani also are affiliated with Polytechnic of Turin, Italy. The work received financial support from the Center for the Advancement of Science in Space (GA-2013-118, CASIS GA-2014-145) and an R21 exploratory and developmental grant from the National Institutes of Health's National Institute of General Medical Sciences (NIH R21 GM 111544), as well as funding from the Nancy Owens Memorial Foundation. Membranes were provided by NanoMedical Systems. For more information about Houston Methodist, visit houstonmethodist.org, or follow us on Twitter and Facebook. Citation: Unexpected behaviors in molecular transport through size-controlled nanochannels down to the ultra-nanoscale. Nature Communications DOI: http://dx.doi.org/10.1038/s41467-018-04133-8 (online April 27, 2018) G. Bruno, N. Di Trani, R. L. Hood, E. Zabre, C. S. Filgueira, G. Canavese, P. Jain, Z. Smith, D. Demarchi, S. Hosali, A. Pimpinelli, M. Ferrari and A. Grattoni.